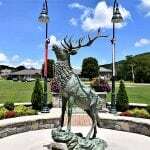 Banner Elk, located in the mountains of Western North Carolina, is known for it’s outdoor spaces and luxurious living. With numerous world-class restaurants, award-winning vineyards, ski slopes, and hiking trails, Banner Elk is the picture of ideal mountain living. Whether you are looking for a year-round permanent home or a seasonal residence, you are sure to find a property that proves to be well worth the investment.